Taylor makes alternative approaches to personal well-being seem easy, interesting, and fun. A traumatic childhood with a father who went into rages and denigrated her; teen years self-medicating with drugs, alcohol, pills, and risky behaviors; the development of odd and disabling symptoms that defied diagnosis; and later, doctors’ prescriptions for antidepressant and antianxiety medications that left her either robotically numb or wind-up-doll jumpy brought Madisyn Taylor to the point where she no longer cared to live. Getting off all medications and seeking natural solutions was her final attempt to salvage what was left of her broken health and spirit. Taylor’s decision to follow a natural path to wellness led to consultations with more than thirty different types of healers and to intense research and practice to discover what worked best for her. 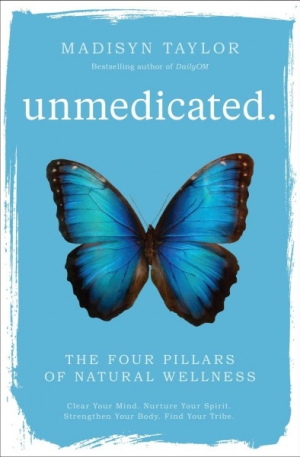 “Unmedicated offers an alternative, holistic path for people who want to heal themselves from the crippling effects that excessive reliance on medications such as antidepressants can create in the body, mind, and spirit,” she writes. While simple, her Four Pillars of Natural Wellness require dedication and a willingness to step out of your comfort zone and become an advocate for your own health. Before accepting a prescription, Taylor advises asking your doctor questions about the underlying root cause of your illness and whether making lifestyle changes would help. She also advocates taking back your power through independent research and advises the same approach when exploring alternative treatments. Taylor’s Four Pillars are: Clear Your Mind (meditate and connect with nature); Nurture Your Spirit (keep a journal, write to the wounded part of yourself, unleash your creativity, and look for ways to serve others); Strengthen Your Body (walk at least five days a week, nourish your body and brain with healthful foods and supplements); and Find Your Tribe (connect with friends, give back, discover your purpose, and have fun). And if you’ve been turned off by these methods before, or think they may be too hard to fit into your busy schedule, don’t worry. Taylor makes them easy, interesting, and fun.